In light of the current strawberry-confidence crisis, what options can packers look at to protect their produce and businesses? Just now there is a crisis of consumer confidence in the Australian strawberry market: there have been some 100 reported instances of needles or pins being found in strawberries in Queensland, NSW, Victoria, Tasmania and South Australia. New Zealand has stopped all imports of strawberries from Australia, and as a result of all of this, strawberry sales right across the nation have plummeted. Growers and packers are therefore looking for ways to ensure that what they supply is safe to eat. There are some reliable, easy and effective processes that can be put in place very quickly – in particular, metal detection and X-ray. Other processes, such as having tamper-proof packaging, could also be put in place, and while those methods would potentially protect strawberries, what about apples, pears, oranges, lettuces and other fresh produce? Here’s more on coding, labelling & inspection in Australia’s fresh produce industry. Of course there are the questions of where and how any contamination takes place. I’ll leave those for another day, but it is worth noting that at least some of Australia’s major supermarkets – Coles, Woolworths and Aldi – have been pushing Australia’s fresh produce suppliers toward implementing metal-detection systems over the past years. Thus far, there has been limited uptake. It’s not until something such as what we have right now with this strawberry crisis that everyone again looks seriously at what can be done (and hopefully actually does something about it). See how an inspection system won a large deal for a contract baby-food packer, and find out how a fresh-produce packer reduced their risk of incorrect labelling – plus more installations – all here. Putting solutions such as tamper-proof packaging aside, let’s get back to the two proven, reliable, efficacious and cost-effective methods, which can be implemented very quickly, that I mentioned earlier: metal detection and X-ray. You can find more information on tamper-proof and labelling here. What is the largest size package that you want to inspect? You can inspect unpackaged products, individual packs, boxes, crates or pallets. It will be more cost effective to inspect larger packages, but, critically, the result will deteriorate as the package size increases. So, the largest package you want to inspect will determine the size and cost of the machine you need to purchase and will also determine the sensitivity that can be achieved. What do I mean by “sensitivity”? I mean that the more sensitive a system, the smaller the contaminant that can be found. So in fact, the smaller the package size that you are going to inspect, the better it is for the sensitivity. 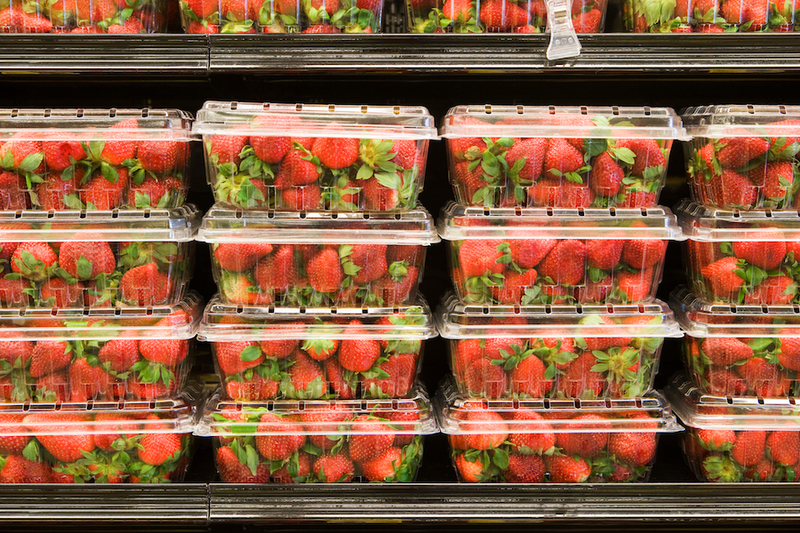 In the case of strawberries, it is much better to inspect a punnet than a whole tray or pallet. What type of contaminant do you want to detect? If you want to detect metal contamination only, then metal detection may be a good solution. But if you want to detect glass, stone or bone, or the shape and size or count the number of items, then X-ray is much more likely to suit your application (metal detection will definitely not suit here). What size contaminant do you want to detect? Whether your customer has stipulated a specific size of contaminant that needs to be detected. What you can accept. What I mean here is a simple trade off: it generally costs more to detect a smaller contaminant, but detecting the smaller contaminant gives you greater security. If something does go wrong, which one will you say? “I put in a system that didn’t deliver any real benefit, but allowed me to tick the box” … or “I put in the best possible system that was available at the time and thus did everything reasonably possible to avoid problems occurring.” Which statement do you think will go over better in court? In the case of the strawberries, if the contamination in the market is from needles, does the system that you are looking at have the capability to detect needles? What temperature range do you expect the product to have? Metal detectors are sensitive to temperature in that the warmer something is, the worse the result. By the way, they are also sensitive to salt and moisture – the higher the content of either of these, then the worse the result. By contrast, these three factors do not effect X-ray results. What sort of audit trail do you want? This is becoming more and more important as time goes by. With metal detection, you can get counts of the number of products checked, the number of rejects and so on. With an X-ray you can get the same counts as well as, if desired, record an image of every product checked. Then if you do get a complaint, you can check every image from that day and effectively prove that when the product left your premises, it was fine. This is metal detection boffin talk. It simply means that metal detectors are more sensitive to some metals when they are facing a certain direction and less sensitive when those same metals are facing another direction. X-ray technology is not subject to the same effect. X-rays see virtually all metals as the same, regardless of which orientation they have. Perhaps a good way to illustrate this is to explain that it is possible to find a pin in strawberries using metal detection provided that the pin is facing the right way. However if it is not facing “the right way”, then you have a serious problem. If I invest in this technology, is there a 100% guarantee that every metal contaminant will be found? While I’d like to say “yes, it just would not be true. There are no guarantees in life, and installing either system does not give you a 100% guarantee. What is does do is substantially reduce the risk to your customers, which substantially reduces the risk to your business and to you. Without naming them, I can recall an incident where a company was contract packing food for a large multinational and the contract packer did not have any metal contaminant detection systems in place. A contamination occurred and they had to pay for a nationwide recall. Then they lost their contract. Within a month they were broke and out of business and being sued. Is that how you want to be remembered? Another thing worth mentioning when considering metal detectors and X-ray, is that neither can detect insects, hair nets, skin, cardboard, etc.So there are limitations. Don’t forget to take a few minutes to look at the machine itself: how easy is it to use the system? To set up a new product? To run an existing product? To clean? To maintain? Finally, look at the supplier: how long have they been selling this technology? Do they know their stuff? How long have they been in business? Are they reputable? If you want to discuss a metal detection or X-ray system for your fresh produce (or any goods), please contact us. You can contact us quickly here. You can also check out Matthews’ large resource library. It’s full of all sorts of information that’s all free to download. Andrew Key has over 25 years’ experience with packaging machinery, inspection technologies and identification technologies. His career spans across organisations like Alfa Laval, TNA and others; helping manufacturers to effect process improvement using the latest technology from around the globe. In his current role as the Business Development Manager for Inspection technologies at Matthews Australasia, he is constantly looking at cutting edge technologies for our customers to improve quality control. Andrew grew up in the country and loves the outdoors. In his spare time he enjoys sailing, snow skiing, water skiing, bushwalking and camping. This entry was posted in Innovation and Best Practices, Machine Vision & Quality and tagged featured.